Crowds started gathering outside the Minnesota Public Utilities Commission's offices by 5:30 a.m. on June 18. People were portaging canoes through the heart of downtown St. Paul. All eyes were on a bland office building in the heart of Minnesota's capital city, where a meeting of five government regulators was about to begin. Years of protests, rallies, legal fights, paperwork, public hearings and ad campaigns had led to this. It was all over an oil pipeline. Enbridge Energy wanted to replace its aging Line 3 oil pipeline to carry Canadian crude along a new route across northern Minnesota. Opponents urged the state to block the project, arguing it violates Native American rights, threatens the environment and is an unnecessary addition to a world that needs to move more quickly from fossil fuels to avoid a climate change crisis. Nearly all sides in the debates around Line 3 agreed that fossil fuels are not the basis of our future. But, in the end, demand for oil prevailed. Minnesota regulators decided that the state needs this oil pipeline, so they granted Enbridge two major approvals required to build its Line 3 replacement. While Enbridge still must obtain several additional permits for Line 3, the regulators' blessing is likely the biggest hurdle it would need to overcome. Enbridge officials say that the company plans to begin construction on the Line 3 replacement project in Minnesota by early next year. They'd like to see the new Line 3 route in operation before the end of 2019. But the battle against pipelines in Minnesota is far from over. The morning after state regulators approved Enbridge's proposal, the fight the opponents had promised was underway. About 20 people traveled to a remote part of Minnesota where the Ojibwe once lived, about two hours north of St. Paul near the Fond du Lac reservation. The land is right along the Minnesota-Wisconsin border where the new Line 3 will cross. "We will be out on this line, and we will stop this in the regulatory process, we still stop this in the legal process, and we will stop this with our bodies," said Winona LaDuke, a climate and Native American activist. In addition to protests, opponents of the project say they are planning to also file appeals. This is where the pipeline fight in Minnesota is headed. This is the pattern that's played out, over and over again with pipeline projects in recent years, the most prominent so far at Standing Rock. This is a fight without an end in sight. Coverage of the PUC hearings | MPR News covered each day of the Public Utilities Commission hearings, from whether the pipeline is needed to potential routes to cheating accusations to oil trains. And, of course, Decision Day. PUC-what? 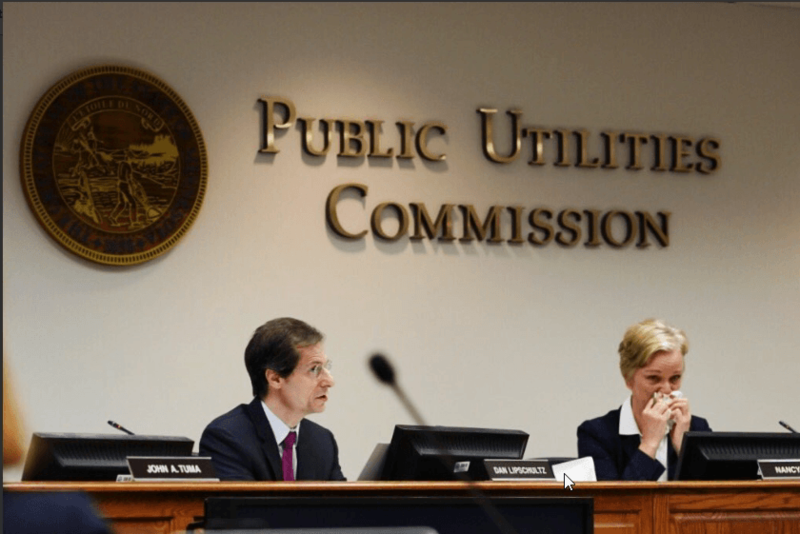 | MPR News reporter Elizabeth Dunbar explains exactly what the Minnesota Public Utilities Commission is, who's on it and what it does. Line 3 still has regulatory ground to plow before bringing in bulldozers | Gov. Mark Dayton's office has tallied 29 more approvals needed before construction can start. Click here to read Elizabeth Dunbar's story on what lies ahead for the pipeline.